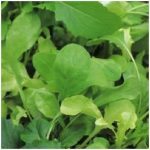 Microgreens ‘Spicy Mix’ contains mizuna, mibuna, mustard ‘Red Frills’, rocket ‘Dentallata’, mustard ‘Red Lace’, Pak Choi ‘Golden Yellow’, mustard ‘Pizzo’, tatsoi, mustard ’Red Zest’, Pak Choi ‘Canton White’, rocket ‘Napoli’. 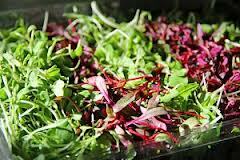 Microgreens are very easy to grow. 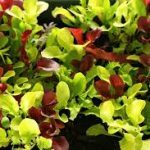 They can be grown in a garden bed, in containers, or inside on a sunny windowsill. If grown in a bed, loosen the soil and rake it smooth and level, then scatter the seeds (broadcast) about 0.5cm apart. Then rake it over again. 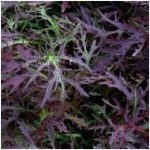 If sown in trays or other containers you’ll need a minimum of 5cm depth of seed compost. Scatter seeds into trays and cover with 0.5cm compost. Harvest when seedlings are 3-6cm tall.